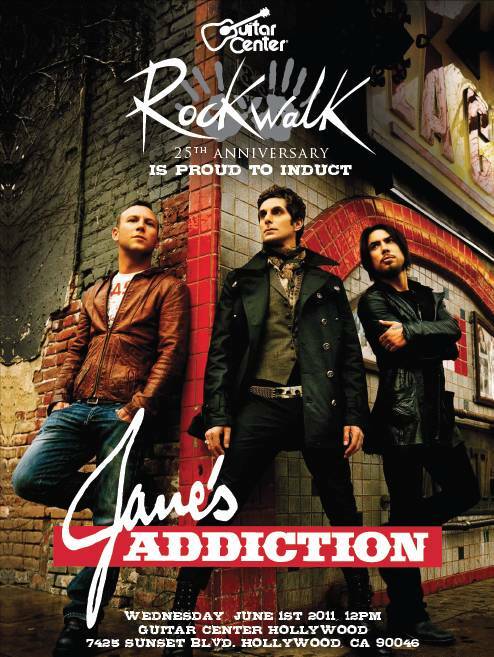 Jane’s Addiction will be inducted into Guitar Center’s Rockwalk hall of fame on June 1, 2011 at 12pm PT. Westlake Village, CA – Guitar Center, the world’s largest musical instrument retailer, today announced that Jane’s Addiction will be inducted into the historic Guitar Center RockWalk in Hollywood on Wednesday, June 1st at 12pm PST. Band members Perry Farrell, Dave Navarro and Stephen Perkins will be inducted in a special ceremony at Guitar Center Hollywood, 7425 West Sunset Blvd., with Rage Against the Machine’s Tom Morello giving the induction speech. Guitar Center’s RockWalk is dedicated to honoring those artists who have made a significant impact and lasting contribution to the growth and evolution of Rock ‘n’ Roll, Blues and R&B. Jane’s Addiction’s handprints will reside alongside the handprints, signatures, and faces of other accomplished musicians and innovators including Jimmy Page, Jimi Hendrix, Eric Clapton, Elvis Presley, Carlos Santana, Johnny Cash, Van Halen, AC/DC, Bonnie Raitt, Aerosmith, Carl Perkins, Marvin Gaye, James Brown, B.B. King, Stevie Wonder, Run-D.M.C and Queen, among numerous others. Over the course of their 25-plus year career, Jane’s Addiction merged alternative and rock like no one before, becoming the first alternative rock band and creating a new sound and attitude in the process. Writing the rulebook for alternative music and culture through their combination of genre-defying classic songs and trademark cinematic live experience, Jane’s Addiction has sold over seven million records in the U.S. alone, garnering Grammy nominations and spearheading the movement of modern American festival culture by launching and headlining Lollapalooza. 2011 marks another momentous year for Jane’s Addiction, with the band set to tour the world and release a new album, The Great Escape Artist (Capitol) produced by Rich Costey (Muse, Franz Ferdinand, Interpol) with TV on the Radio’s Dave Sitek brought on as part of the creative team. Back on May 6th Jane’s Addiction performed a very intimate semi-acoustic set at Guitar Center in Hollywood. As we previously reported this show was filmed in 3D for the Guitar Center Sessions. The program will air on September 25th at 9PM ET/PT exclusively on DirecTV. If you are a subscriber, you can find it on channel 101 and in 3D on channel n|3D. They will be making an MP3 of the band’s performance of Jane Says from this show available to download for free from the Guitar Center Sessions site soon. Stephen Perkins was recently interviewed by Guitar Center. In the following clip he discusses Duff McKagan joining the band and its effect on the Jane’s Addiction sound. The other three parts of this interview can be found in our forums. This is part 4 in a 4 part article series about our trip out to L.A. to see Jane’s Addiction. Thursday evening, Jane’s Addiction recorded an appearance for the upcoming TV series Guitar Center Sessions, a high-definition 3D television series for DirecTV. This included the band performing a handful of songs and doing a Q&A with the show’s host. The band discussed their roots, their past break ups, the addition of Duff McKagan, writing new songs, and much more. The live performances included semi-acoustic versions of Ain’t No Right, Been Caught Stealing, Jane Says, and the introduction of a new song titled Broken People. If that weren’t enough, after the band finished playing Been Caught Stealing, Dave asked Perry “do you remember this one…” and broke into the classic song City, which Perry joined right in on. This marks the first time since 1988 that the guys performed this song. This session was an extremely intimate performance in front of approximately 30 people, and to our own amazement, included JanesAddiction.org’s own Mike and myself . After the performance, we were able to watch the playback in 3D, which was truly amazing. We’re not sure when this episode will air, but as soon as we know, we will let you know.